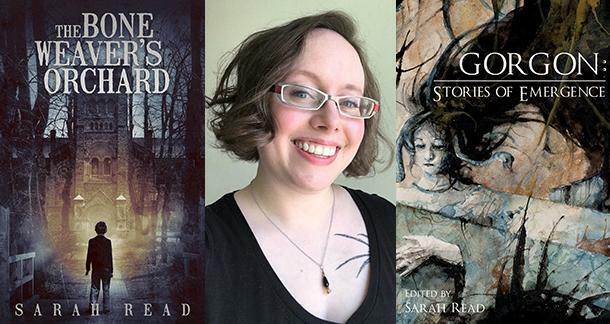 Sarah Read is a dark fiction writer in the frozen north of Wisconsin. Her short stories can be found in Gamut, Black Static, and other places, and in various anthologies including Exigencies, Suspended in Dusk, BEHOLD! Oddities Curiosities and Undefinable Wonders, and The Best Horror of the Year vol 10. Her novel The Bone Weaver’s Orchard is almost out from Trepidatio Publishing, and her debut collection will follow in late 2019. She is the Editor-in-Chief of Pantheon Magazine and of their associated anthologies, including Gorgon: Stories of Emergence. 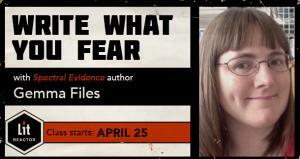 She is an active member of the Horror Writers Association. When she’s not staring into the abyss, she knits. Find her website at Inkwellmonster and follow her on Twitter or Instagram or keep up with her on Facebook. Your debut novel, The Bone Weaver’s Orchard, officially releases February 1st! (Although there’s been a good amount of early readers and buzz!) How are you feeling? Oooh my goodness, I am very excited. And nervous. And delighted. I think some of the early buzz has helped calm my nerves. People have been so wonderful and supportive and I’m very glad that folks are enjoying the book so far! Can you tell us a little about the book itself? What kind of reader are you aiming to find? The book is a gothic mystery set in an English boarding school in 1926. There are large insects, larger spiders, secret passages, withered apples, misplaced headstones, misplaced bodies, and a few unnecessary surgeries. I wrote this book for my teen self—I loved horror, but teen horror wasn’t scary. Adult horror was scary sometimes, but I couldn’t relate to the characters or their stakes. I wanted a book that would be tense enough to please teen readers and adults alike, that both could relate to. One that adults will think is too scary for teens (it’s not—they’re better at horror than you are, grownups). I’d shelve it in adult horror, though. That’s where the teens are looking, anyway. If you don’t mind sharing, I love to hear about debut authors’ journeys. Is TBWO the first novel you’ve written? What was your process to getting it published? It is indeed the first novel I’ve written! I wrote it for NaNoWriMo in 2014. I had only written a few short stories up to that point, and every attempt at a novel seemed to wrap up at around 5k words… But this one finally clicked. I didn’t have an outline, just a general idea of things. The first draft was a mess, of course. I edited for a while, did a round of beta reads, edited more, then a novel crit circle with some LitReactor friends (hi friends), then more edits. I submitted bits and pieces of it in LitReactor classes and received feedback from teachers (hi teachers). When I finally had a solid draft, I sent it out to a few agents. One requested a full manuscript, and then a revise-and-resubmit. He gave me an excellent editorial letter with the revision request, and I used that as a guide for another draft. I could tell from his feedback that he really understood what I was trying to achieve with the novel, so I stopped submitting elsewhere and focused on the changes he’d suggested. I then made a huge mistake and hired a freelance editor who turned out to be a con man. He put my project off for ages with a long list of excuses—then eventually he disappeared with my money. It was a fairly large scandal in the industry at the time, so the agent understood the delay. My HWA mentor, Danielle Kaheaku (hi Danielle!) stepped up and read the whole draft and got me her feedback in just a few days (she’s amazing). I used that to refine my draft and sent it back to the agent. Unfortunately, he decided not to take on the manuscript, but he liked my writing and asked me to send him my next book (which I will). In the years that had passed while all this was going on, I’d become a lot more familiar with the industry and had seen beautiful books coming from small presses. I decided to try a few of my favorite ones. I subbed to JournalStone first and struck gold! I could not be happier with how it’s turned out. It does feel different when I’m writing a novel. I get to really sink into the details and spend time with them. I first found you through your short fiction. (We’ve shared several ToCs, including Suspended in Dusk II and Shadow Booth Vol. 1.) How different was the experience of writing a novel from short stories for you? Would you do it again? I definitely will do it again—I’ve done it twice again, already! I have a novel manuscript that’s in its third draft that I hope to get finalized by the spring. And another one in a zero draft that I hope to get to beta readers before the end of the year. And I’ve started an outline for a possible series. I don’t know what unlocked the long-format story in my brain. It does feel different when I’m writing a novel. I get to really sink into the details and spend time with them. Of course, the logistics are more difficult. Maintaining tension and continuity is harder. Changing one detail cascades into an avalanche of edits over hundreds of pages instead of twenty. But I love it. I still love writing short stories, too. I’ve been distracted by the longer pieces, so I haven’t written as many lately. I’m hoping to focus more on short fiction this year. Um. Between all those novels I mentioned, I guess. You also edit Pantheon Magazine, and have an anthology through them, Gorgon: Stories of Emergence, coming out this year as well. How do you find that editing intersects with your writing? Are there times you wish you could pick one, or do they often feed each other? I’ve been editing magazines for about ten years, but only submitting my fiction work for the last five. I do think that editing helps me become a better writer, and being a writer helps me be a better editor. It’s helpful to understand what’s happening on both sides of the editorial desk. I have heard people suggest that I shouldn’t do both, but I can’t stop. I’ll be forced to focus more on writing this year, though, as Pantheon is taking a brief hiatus while our publisher finishes up a new degree in school. But I hope Gorgon will hold people over till we can start up again. It’s a wonderful book—I’m really proud of what we’ve put together and grateful to all the contributors for their beautiful work. Your love of fountain pens and notebooks is well documented. When I realized that you actually draft your fiction by hand—even your novel—it blew my mind. Tell me more. Tell me why. Tell me why fountain pens! There’s a tactile bliss in dragging a pen across the paper. I think better on paper than I do at a keyboard. I am frequently chasing my kids or running around between schools and libraries and appointments, so a notebook and pen are essential tools of convenience, too. They don’t need wifi or battery power. They go with me everywhere. I get a lot of writing done in the moments between things, partly because that’s often all the time I get. My love for stationery started before I even began forming memories, so I’m not sure where it all began. I started using cheap fountain pens in high school because I was weird. In college, I was weirder and used a dip nib pen and an actual inkwell. After I was married, my husband started buying me nice fountain pens. A nice fountain pen glides across the page like butter on hot glass. They write under their own weight, sliding along their own ink path. You don’t have to press at all; you just have to guide the pen, so it reduces hand fatigue. I can write with a fountain pen for hours and never feel any tension in my hand or arm. And you can get pens in fun designs and ink in any color you can imagine. They’re fun, but practical, and each one is a work of art. Your other passion seems to be knitting and other textile crafts. How did that come to be? Is it a supplementary income, a hobby to take your mind off writing, or something else altogether? Yes! Yes to all of the above, haha. I started crocheting in my teens. In my mid-twenties, I began designing my own patterns. Then I learned spinning and knitting and weaving. Then I began working as an editor for a crochet magazine. I did that for a long time, and continued to design and publish my own designs even after I left the craft magazine world. I still do, though not as often since I had my youngest kiddo. I still craft regularly, but I don’t have the time or energy to pull all-nighters stitching to a publication deadline. It’s kind of nice that it’s become a hobby again, actually. It’s more relaxing! I would tell them thank you for being readers—not of my work (though double thanks for that), but in general. The world needs its readers. The world needs its readers. So we know about The Bone Weaver's Orchard and Gorgon: Stories of Emergence coming out. And I’ve seen some hints about another contract that’s already been signed. Can I ask about that? What’s next for Sarah Read? I’ve just signed the contract for my debut short story collection! This will also be published through JournalStone/Trepidatio, and it will be out later this year. I’m very excited. It contains a dozen or so of my favorite reprints and a handful of new pieces, including a novelette inspired by my love for The Stanley Hotel in Estes Park, Colorado. I don’t know an exact release date or title yet, but I’ll have updates on my website and on social media. I’ve also had a few short story invitations for the year, so there should be new short pieces out from me, too. Thanks so much for talking with me today! Thank you, Annie! I love your work and love that you’ve taken the time to chat with me, especially for LitReactor, which is one of my favorite places on the internet. It was the first place I settled when I decided to start taking my writing seriously. I have big-cotton-candy-heart-eyes feelings for LitReactor and all of the wonderful things it does for writers. Congratulations Sarah, I'm really excited for you :) I remember reading the opening pages of this in Suzy's seductive beginnings class, and between the craft, kids, slush piles etc it sounds like you work super hard! Much respect, enjoy this you deserve it.